Oscar-winning screenwriter Aaron Sorkin slammed Tim Cook in a recent interview for comments the Apple CEO made regarding authors, filmmakers and documentarians focusing on the life and times of Steve Jobs. When Cook appeared on "The Late Show with Stephen Colbert" last week, Colbert asked what he though about a spate of films about Jobs, some of which portray the tech guru in a negative light. Some label Sorkin's upcoming film "Steve Jobs" as a critical dramatic interpretation of key periods in the late Apple cofounder's life, while a recent documentary from Alex Gibney takes a definitively harsh slant on Jobs' impact on industry and those around him. Cook, who had at the time not seen either film, said, "I think that a lot of people are trying to be opportunistic and I hate this, it's not a great part of our world." Being framed as an opportunist apparently didn't sit well with Sorkin, who told The Hollywood Reporter that he and some of his team took pay cuts to get "Steve Jobs" made. "Nobody did this movie to get rich," Sorkin said. 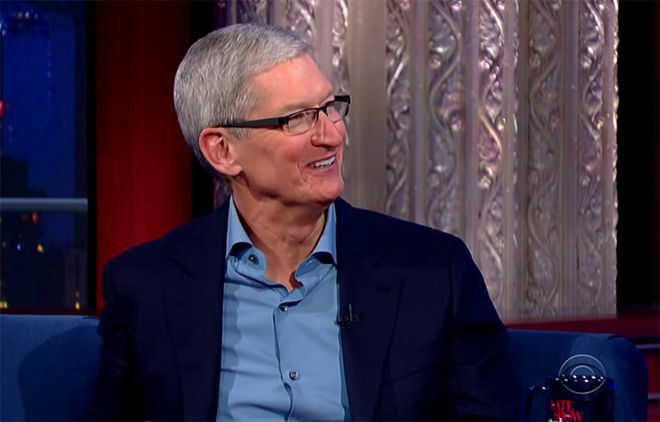 "Secondly, Tim Cook should really see the movie before he decides what it is." Sorkin reserved his most piercing barb for last, "Third, if you've got a factory full of children in China assembling phones for 17 cents an hour you've got a lot of nerve calling someone else opportunistic." "Steve Jobs" is the latest in a string of films and books that attempt to distill Jobs' private and business personas into a single digestible work. The film, based on Walter Isaacson's official Jobs biography, stars Michael Fassbender in the title role and has so far enjoyed a generally positive response from critics. "Steve Jobs" is due for release on Oct. 9.